ALL of the prophecies below were made hundreds, some thousands, of years before Jesus Christ was born. Looking in the face of how He literally fulfilled them all (plus hundreds more), it is an impossibility that He is not Messiah, Savior of the world. The ONLY person… past, present or future… who could fulfill all these prophecies is Jesus Christ. In Isaiah 46, the Lord reminded the prophet, “Remember the former things of old: for I am God, and there is none else; I am God, and there is none like Me, declaring the end from the beginning, and from ancient times the things that are not yet done…” Isaiah 46:9-10. The 100% accurate and fulfilled prophecies throughout the Bible are THE great internal proof that it alone is God’s book to mankind. Regardless of what many of today’s popular preachers are touting, may we soberly seek to understand the importance of prophecy in God’s Word. Jesus came exactly when He said He would. He came in the “Fullness of time”, just at the right time. Jesus, who is God, knows the end from the beginning and has told us the things that will happen before they happen so that when they happen, we will know that He truly is the Son of God. God used prophets to give clues about the: who and what and where and when and why ,concerning the Messiah, the Chosen One, that people were to be using to look for Him. People were to be looking for the Messiah, the Chosen One, that was to come and save them from their sins. The prophets were given these clues to speak and write down hundreds and sometimes even thousands of years before Jesus was ever born on earth as a man, never stopping being God. These clues or prophecies are what make the Bible separate or totally different than any other religious book or book written by people in the entire world. God’s word is in a category all of its own. That would make sense if there is only one God: one God, one book. God’s clues, spoken by His prophets were to be searched and the people should have been longing for, wanting the Messiah to come. This is what Christmas is all about! God’s promise finally happened. Emmanuel, God with us, was born into the world and was named Jesus which means “Jehovah or YHWH or I AM, is salvation.” There is no other Savior than God Himself. Christmas was God’s word, His promise, becoming flesh. Jesus is the Word of God in the flesh. Christmas is what proved that God’s promise really did happen and because this promise of Jesus happened along with many other prophecies given by God, we know we can trust Him in His word for those things that have not happened yet. He came once and people were to be watching, and He promised that He would come again to bring His children to where the Father is, in heaven and then finally return for good as the ruling King over this earth. Be watching. Don’t be like those who didn’t watch for His first coming, but be paying attention, looking forward to the King who is coming again. Jeremiah 29:11 was Cherrie’s and my marriage life verse. It held us through many twists and turns, reminding us to always keep our eyes on Jesus! Hebrews 12:2. For those believing couples struggling through their marriages, please don’t give into the fleshly pride which daily plagues our hearts and minds. Humble yourselves, preferring one another above your own desires. Romans 12:9-10, James 4:10. Submit to the Lord, not your feelings. James 4:8. Draw near to God! James 4:7. Keep your eyes on Jesus. Hebrews 12:2. Pray that the Lord will give you His eyes and heart toward your spouse. John 13:34. Be slow to speak and quick to listen. James 1:19. Don’t let the sun go down on your anger. Ephesians 4:26. Love one another as Christ has loved you. John 13:34. Let Jesus be the Head. Colossians 1:18. Be a minister to your spouse. 1 Timothy 4:6. Work harder at your marriage than your job! Colossians 3:23-24. God’s mercies are new every morning. Lamentations 3:22-23. So should it be with us. Be merciful, slow to anger, letting the peace of God rule your heart. Proverbs 14:29, Colossians 3:15. Let the Lord’s Light examine you and examine yourself. Psalm 26:2, 2 Corinthians 13:5. Take the log out of your eye so you can lovingly remove the speck in your spouse’s. Luke 6:42. Think of this… If you got a call right now that your spouse was being held hostage, would you be filled with a desire to pray and lovingly rescue him/her? Remember that love. Remember we are all broken sinners saved by the grace of Jesus Christ alone. Ephesians 2:8-9, 1 Timothy 1:15-16. Be tenderhearted, forgiving one another as God for Christ’s sake has forgiven you. Ephesians 4:32. Bear one another’s burdens and so fulfill the law of Christ. Galatians 6:1-2. Then when the burdens get heavy, remember to let Jesus bear them. Look at Him and learn of Him. His yoke is easy and His burden light. Matthew 11:30. Do not worry, instead seek first the Kingdom of God. Matthew 6:23. Remember, we don’t live by bread alone, but by every Word that proceeds from the mouth of God. Matthew 4:4, Luke 4:4. Just as we should sit together over dinner, so sit together over the Word. Feast regularly and consistently on God’s Word both independently and as a couple. Psalm 34:8. Let Jesus be in the midst. Matthew 18:20. Let the Holy Spirit, not worldly methodologies or psychologies and philosophies be your teacher. 1 John 2:27. Let Jesus be the One who renews and transforms you and your marriage. Romans 12:2, Titus 3:4-7. Earnestly pray for one another (even when you don’t feel like it) and pray together. James 5:16. It’s hard to be mad at someone you pray for and pray with. Pray, pray, and then pray some more!!! Romans 8:26, 1 Thessalonians 5:17. 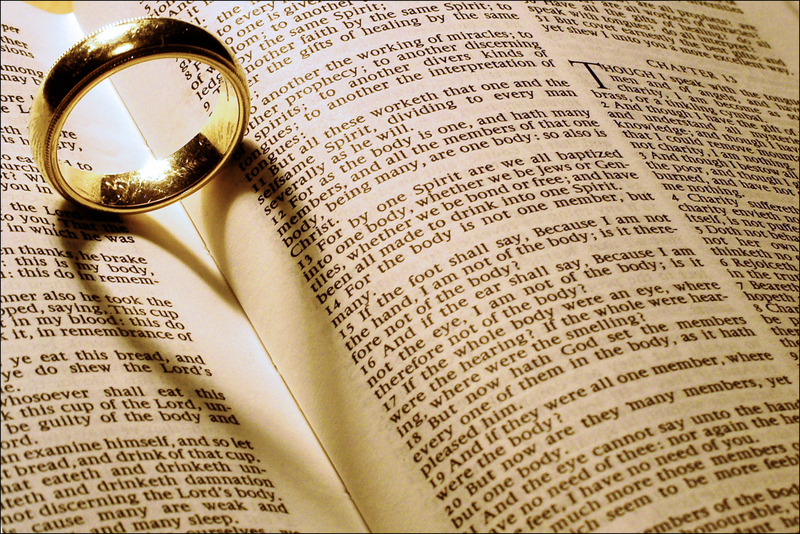 Remember, your marriage is a microcosm of Jesus and His bride, the church. Ephesians 5:25-33. Just as He has nurtured and bound together born again believers around the world for centuries, so must He be the One who knits you as one. Ephesians 4:16, Colossians 2:2-3. Stick with it. Don’t grow weary in doing well. Galatians 6:9, 2 Thessalonians 3:13. Don’t believe the lies of this world, of self, or the enemy of our souls. John 8:44. He only seeks to kill, steal and destroy. His pleasure is in tearing down, not building up. Jesus came so we could have abundant spiritual life in Him. John 10:10, John 15. Hang tight to Jesus and again, never stop praying for one another. Romans 8:26, 1 Thessalonians 5:25, James 5:16. You are not stuck when you’re abiding in Christ. Trust in Him! 2 Samuel 22:31, Psalm 18:2. Let Jesus be your comfort, not your spouse. Psalm 119:76, Isaiah 12:1, Acts 9:31, Romans 15:4. Let Jesus be the One who brings fulfillment. 1 Corinthians 15:28. Remember, Jesus came to save, not destroy. Luke 9:56, John 10:10. Let Him do His marvelous work. Let patience have her perfect work. James 1:4. Be bold. Speak the truth, but always in love. Ephesians 4:15. Cast your cares upon Him, for He cares for you! Psalm 55:22, 1 Peter 5:7. Don’t lose heart. 2 Corinthians 4:16. Jesus has overcome the world! John 16:33, 1 John 5:4.